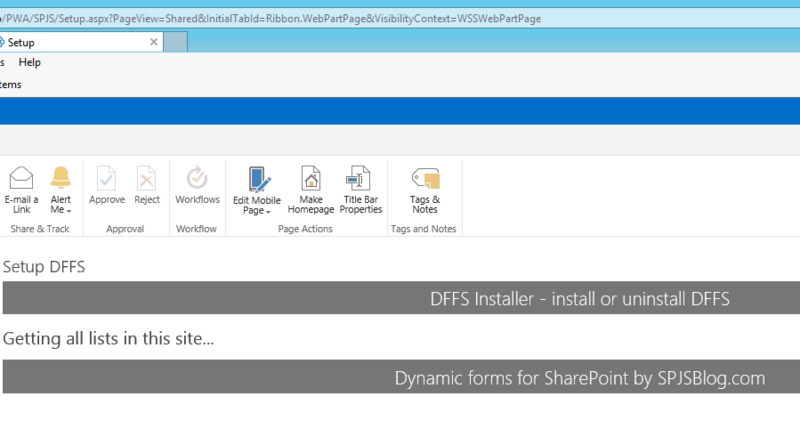 New installer "hang" on "Getting all lists in this site…"
› Forums › Dynamic Forms for SharePoint › New installer "hang" on "Getting all lists in this site…"
This topic contains 8 replies, has 3 voices, and was last updated by Brandon W Green 4 months, 1 week ago. I use chapter “DFFS installer local version” from instalation manual. No – today – it works, with no intervention..
OK, let me know if you have any more issues. This has been happening with my Installer all week. I monitored before posting / ress’ing this thread to ensure it was not a timing issue like the OP. No errors or warnrings found in the console view. Last night, I let it load for ~15 min to see ensure it was not my lack of patience. It’s hard to tell what it is, but hit F12 and select Console and then reload the page – post any errors. The Installer_CEWP_code.html file must be loaded in a web part page inheriting from the default master page by adding a web part page with a Content Editor Web Part and then linking to the html file in the Content link field. Is this how you are loading it? Yes, this is the manner in which it is being loaded. Revisited the console to see if any additional errors were occurring or if we had the same block point, and it magically worked. Not sure what the issue was upfront but I appear to have experienced the same ‘hiccup’ as the above party. If the error occurs again, I will return here with additional details!